Despite the tumor-shrinking medical miracle that has bought her a few years, Hazel has never been anything but terminal, her final chapter inscribed upon diagnosis. But when a gorgeous plot twist named Augustus Waters suddenly appears at Cancer Kid Support Group, Hazel's story is about to be completely rewritten. Insightful, bold, irreverent, and raw, `The Fault in Our Stars` is award-winning author John Green's most ambitious and heartbreaking work yet, brilliantly exploring the funny, thrilling, and tragic business of being alive and in love. This book comes from the `New York Times` bestselling author of `Looking for Alaska`, `An Abundance of Katherines`, `Paper Towns` and - with David Levithan - Will Grayson, Will Grayson. John Green has over 1.2 million Twitter followers, and almost 700,000 subscribers to Vlogbrothers, the YouTube channel he created with his brother, Hank. `The Fault in Our Stars` will capture a crossover audience in the same vein as Zadie Smith, David Nicholls' `One Day` and `Before I Die` by Jenny Downham. `Electric ...Filled with staccato bursts of humor and tragedy.` (`Jodi Picoult`). 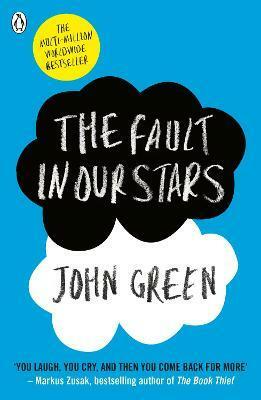 `A novel of life and death and the people caught in between, `The Fault in Our Stars` is John Green at his best. You laugh, you cry, and then you come back for more` (Markus Zusak, author of `The Book Thief`). John Green is an award-winning, `New York Times` bestselling author whose many accolades include the Printz Medal, a Printz Honor, and the Edgar Award. With his brother, Hank, John is one half of the Vlogbrothers (youtube.com/vlogbrothers), one of the most popular online video projects in the world. You can join John's 1.2 million followers on Twitter (@realjohngreen) or visit him online at johngreenbooks.com and fishingboatproceeds.tumblr.com. John lives with his wife and son in Indianapolis, Indiana. John Green's witty yet heart-breaking tour de force. The multi-million #1 bestseller, now a major motion picture starring Shailene Woodley and Ansel Elgort. "I fell in love the way you fall asleep: slowly, then all at once. "Despite the tumor-shrinking medical miracle that has bought her a few years, Hazel has never been anything but terminal, her final chapter inscribed upon diagnosis. But when a gorgeous plot twist named Augustus Waters suddenly appears at Cancer Kid Support Group, Hazel's story is about to be completely rewritten.Insightful, bold, irreverent, and raw, The Fault in Our Stars is award-winning author John Green's most ambitious and heartbreaking work yet, brilliantly exploring the funny, thrilling, and tragic business of being alive and in love.Sunday Times (Culture)'A touching, often fiercely funny novel'The Sun on Sunday (Fabulous Magazine)'So good I think it should be compulsory reading for everyone! 'Daily Express'John Green brilliantly captures the voices of a young generation while instilling it with the wisdom of a life that has lived too much yet will never live enough.Rather than depressing, the book is filled with dark humour and is written with a beautiful simplicity that draws the reader in so deeply that it's not just the twist and turns but the gently bends and curves that you feel tugging at your emotions... No doubt in the end you will cry but you will also feel that you have discovered a little something about living'Daily Telegraph'The novel, written for teenagers, but proving even more popular with adults'The Metro - 2013 Best FictionThe YA crossover hit of the year. The love affair of two terminally ill teenagers could be mawkish. In fact, it's funny, clever, irreverent and life-affirming.The Guardian'A Smart Book'Grazia'So good! 'Good Housekeeping'John Green may write for young adults, but his intelligent sensitive style means The Fault in Our Starsdefies categorisation... as funny as it is heartbreaking... we defy you not to fall in love with its main characters, Hazel and Augustus. 'The Tablet'A humourous and poignant love story... It's terrifically funny... as well as a moving exploration of loss and grief. And no, it's so much not just for teenage cancer sufferers... it's for everyone. 'Bliss'If you need inspiration when it comes to making the most of a moment, this one is for you'Mizz'Exploring the funny, thrilling and tragic business of being alive and in love, this is a life-affirming tale of two teenagers who are terminally ill. Insightful, bold, irreverent and raw, if this doesn't make you cry, it'll definitely make you think, laugh and maybe even fall in love yourself! '** A thought-provoking love story from the New York Times bestselling author of Looking for Alaska, An Abundance of Katherines, Paper Towns and - with David Levithan - Will Grayson, Will Grayson. ** John Green has over 2.3 million Twitter followers, and more than 2.1 million subscribers to Vlogbrothers, the YouTube channel he created with his brother, Hank. ** The Fault in Our Stars will capture a crossover audience in the same vein as Zadie Smith, David Nicholls' One Day and Before I Die by Jenny Downham. ** 'Electric . . . Filled with staccato bursts of humor and tragedy' - Jodi Picoult** 'A novel of life and death and the people caught in between, The Fault in Our Stars is John Green at his best. You laugh, you cry, and then you come back for more' - Markus Zusak, author of The Book ThiefJohn Green is an award-winning, New York Times bestselling author whose many accolades include the Printz Medal, a Printz Honor, and the Edgar Award. With his brother, Hank, John is one half of the Vlogbrothers (youtube.com/vlogbrothers), one of the most popular online video projects in the world. John lives with his wife and children in Indianapolis, Indiana. John Green is an award-winning, New York Times bestselling author whose many accolades include the Printz Medal, a Printz Honor, and the Edgar Award. With his brother, Hank, John is one half of the Vlogbrothers, one of the most popular online video projects in the world. John lives with his wife and son in Indianapolis, Indiana.